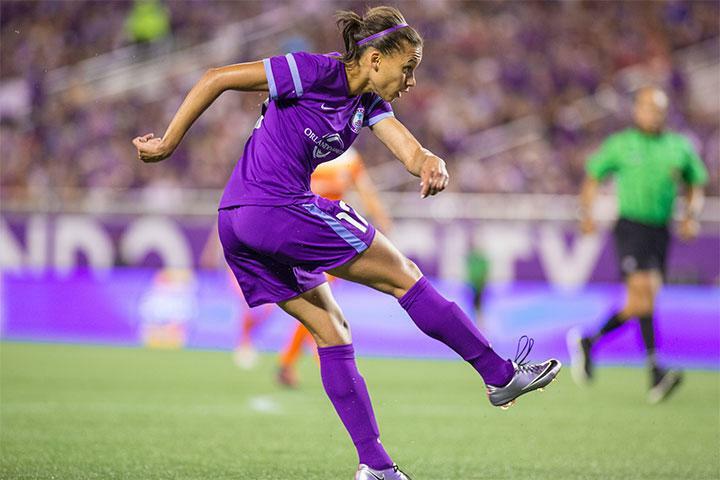 Orlando Pride midfielder Kristen Edmonds will join select Azzurri Storm (AS) coaches for three training sessions on Sunday, December 2 at Vineyards Soccer Fields in Naples. During each 1.5 hour session, Kristen will engage hands-on with AS girls and provide feedback, support, and encouragement. “This is a great opportunity for our girls’ side and we encourage all players to attend,” says Club President John Dina. “Having pro-players as mentors are one of the many perks of our recent Orlando City SC affiliation.” Attendees should wear their full Azzurri Storm training kit, shin guards, and cleats to the training sessions. Kristen Edmonds played at a collegiate level from 2005 to 2008 and graduated from Rutgers University. She started in the USL W-League in 2005 and had a consistent career leading up to her position with Orlando Pride in the National Women’s Soccer League (NWSL). In October 2016 she earned her first U.S. Women’s National Team (USWNT) call-up. Shortly after, in 2017, she was called into the USWNT annual January camp in Carsen, California.